Top billing for the Golden Knights first preseason game of 2018 will likely go to Max Pacioretty. The newest Golden Knight will be making his T-Mobile debut wearing “the shield” as he put it. Many other eyes will be focused on William Karlsson and Jonathan Marchessault returning to the ice together for the first time since June. But the real headliner for this preseason game isn’t any of those three, we know where they’ll all end up. No, the real headliner is Erik Brannstrom who will be stepping onto the T-Mobile ice for his first officially sanctioned NHL game. Brannstrom was the third of the Golden Knights three first round picks in 2017, but he’s risen, at least in my eyes, to become the clear favorite as the top prospect in Vegas’ somewhat stacked system. With the suspension of Nate Schmidt and Shea Theodore still not in camp due to contract negotiations, the Golden Knights blueline is wide open with roster spots. Brannstrom, who just turned 19, dominated in the rookie games and he’s looked very good in the couple of scrimmages he’s played with the veterans. However, doing it at City National Arena and doing it in T-Mobile Arena are different animals sometimes. Brannstrom is part of a defense group of Nic Hague, Nick Holden, Brad Hunt, Colin Miller, and Jake Bischoff. Brannstrom needs to stand out, every single game he’s on the ice if he wants to make the roster. Impressing GM of the Year George McPhee and Jack Adams winner Gerard Gallant enough for them to forego a young player’s waiver exempt status is a tall task. We’ll see if Brannstrom can get it done, but one thing we do know is he’s already impressed his teammates. If you are going to the game tonight (because you can’t watch it otherwise) keep your eyes on #12. He always does something special on the offensive end, and his skating is an absolute joy to watch, but he has to be careful to not overextend himself and give up rushes the other way. Tonight is step one to Brannstrom staking his claim to the NHL roster. In a game with likely only a few bonafide NHLers on the other side, he’s got to stand out, and in a big way. Based on everything we’ve seen in the past though, he probably will. Kind of a bummer no TV for these first 4 games. Have you heard any reason why ? ATTSN opted to not broadcast them. 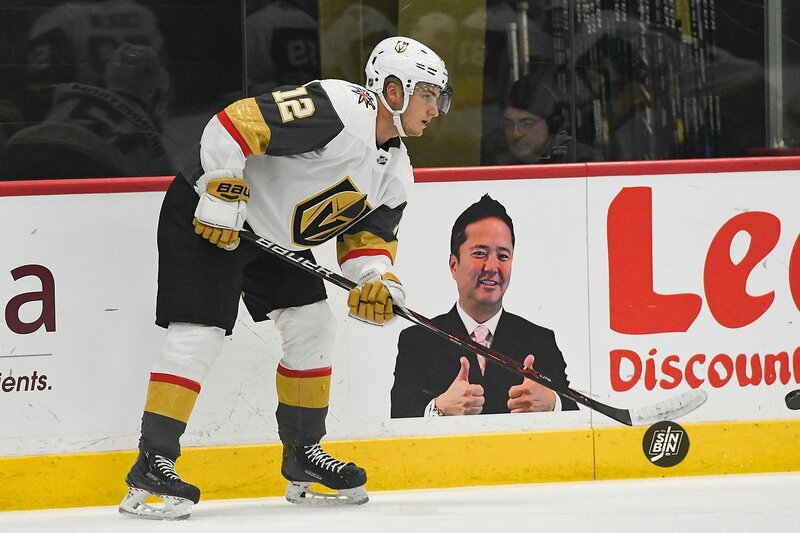 ATTSN was a poor choice by VGK. What will they broadcast instead, an interview with a 1992 Olympic discus champion? I now have Dish (need to keep for non-English channels) & DirecTV both, thanks to them. Travel a lot on business and first tried Cox so I could watch games on app when out of town. Doesn’t work. Switched to Directv, barely works. Not good for fans. Just decided to go in person. Was a great time. It wasn’t so much about preseason not being broadcast. That was just one more thing on top of the rest of it. NHL.com app doesn’t show VGK since they opted for ATTSN. Supposedly ATTSN will be working a deal with Dish but nothing so far. Can you Persicope the game so we can watch….?? !! Bucs starting off the season 2-0 is against the law, too…… !! Oh. My. God. First time since 2010. Honestly think, as good as he looked so far, he only makes the team if at least 1 of 2 things happen. Shea Theodore misses games for hold out and/or Rhinehart is traded for something (or just looks horrible). McNabb, Miller, Holden, Engelland, Merrill, Hunt, are 6. Theodore would be 7, and Rhinehart having to clear waivers makes 8. Don’t worry about Reinhart clearing waivers. It’s going to come more down to if he can beat out Whitecloud, Bischoff, and dark horse candidate Zac Leslie.